It went the distance, but in the end Westmeath were celebrating a stirring Leinster SFC quarter-final win over neighbours Offaly at Cusack Park, Mullingar, last Sunday. Westmeath carved out a 0-13 to 0-12 win as Offaly were left reflecting on a disappointing opening-period performance. Tom Cribbin’s charges battled impressively throughout, departing 0-9 to 0-3 clear at the interval. “It was always going to be tight and tough right until the very end. I suppose there was a strong enough breeze, but probably our defensive game in the first half got us the result,” Cribbin told Midlands 103 Sport. “We just were remarkable to hold them to three scores. I think that is where it was won. Having suffered a third straight Allianz Football League relegation, Cribbin was delighted with how Westmeath responded: “There was a lot of pressure on us because we knew we underperformed in the League,” he said. “Management were very disappointed with themselves, and so were the players. We all knew we didn’t get it right and we had to deliver. That Leinster semi-final against Kildare promises to be an interesting game too for Westmeath’s Kieran Martin, who shared similar sentiments. “It’s all about Championship at the end of the day, you use the League to build up your performance for Championship,” Martin said. “Things didn’t go our way but it was the same last year and we got to the Leinster final. We want to get back there this year. 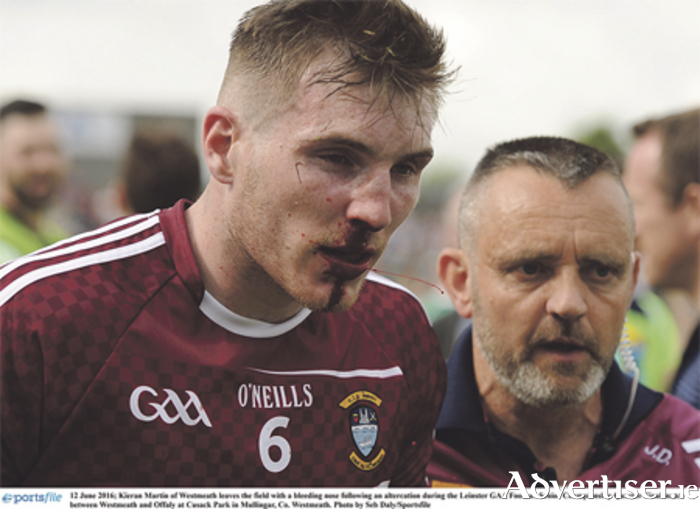 Westmeath’s willingness to graft throughout the match, though, was what pleased Cribbin: “It was an unbelievable first-half performance and in the second half they stuck with it,” Cribbin remarked. “We just defended really well. There was a strong breeze, we knew it was worth three or four points minimum. The lads put in a workmanlike performance, that is what it was there. Local derby games are always like that, it isn’t always the best football. Offaly, managed by former Westmeath supremo Pat Flanagan, left Mullingar severely “disappointed” following the loss: “It is very difficult to take, we have worked exceptionally hard,” Clara native Flanagan said. “We had opportunities, but we just didn’t take them near the end. “We went in six points behind, but I wasn’t overly concerned because we had a severe wind to come in the second half. We never got back to draw the game, if we had I think that we would have pushed on. Westmeath face Kildare at Croke Park on Sunday, June 26, at 2pm.